Red RIBBON TIE - 3 & 1 edge. RIBBON TIE in Marigold - Circa 1911. RIBBON TIE: This pattern is circa 1911. The whirling rays design is also referred to as Comet. Some of the 3/1 edge examples are flat enough (2” high) to qualify as a “plate”, although it would be most difficult to move food off that type edge! 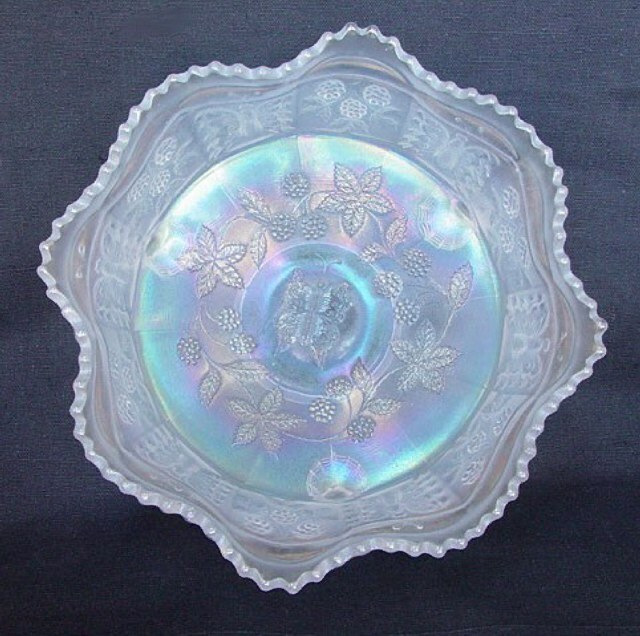 These (flattened, low ruffled bowls) are known in amethyst, black amethyst and blue. They can be 9”-10” wide! 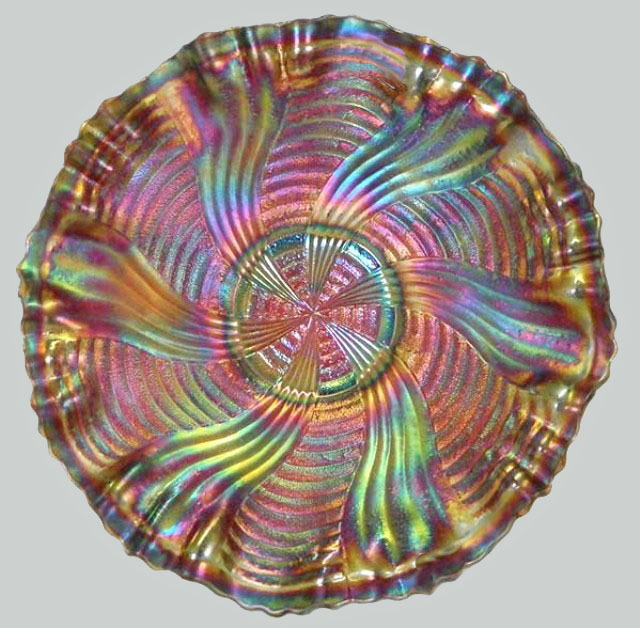 The 8”-9” bowls are found in amethyst, blue (some in a smoky blue tone), green, and marigold. Marigold THISTLE Banana Boat and April 1912 Butler Bros. Ad. Amethyst THISTLE Banana Boat interior. Waterlily & Cattails exterior. 10 1/2. x 7 5/8 inches wide. 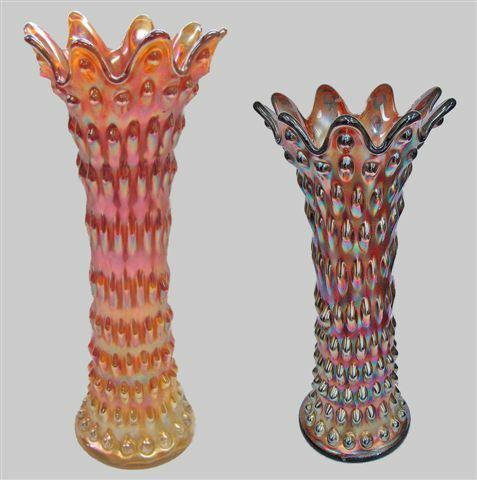 FENTON THISTLE Banana Boat: These oval shaped footed bowls offer the Waterlily and Cattails exterior pattern. Circa 1911 & 1912, they are found in amethyst, blue, (sometimes electric blue), green and marigold. 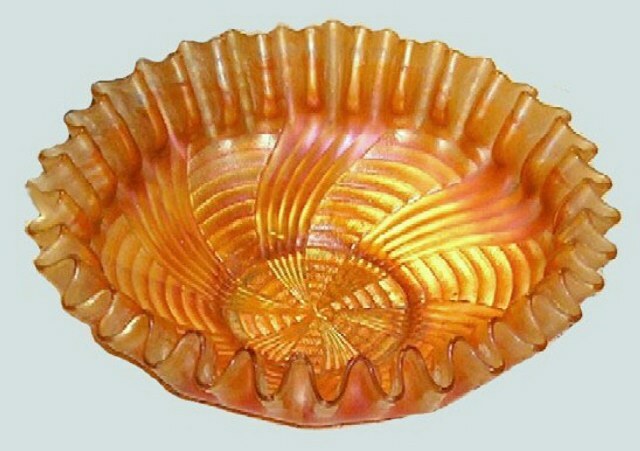 They are referred to as a centerpiece bowl and should not be confused with CARNIVAL THISTLE pattern. ILLUSION Bonbons - Blue & Marigold. ILLUSION Bonbon: A 7” bonbon of an unknown production era. Both card-tray and square shapes are found, with marigold and blue being the only known colors……perhaps suggesting very early manufacture. Certainly not plentiful, they do not bring large sums of money when they appear at auction. 13 inch HEAVY HOBNAIL (VT.) Vase in Marigold & Amethyst. (Satin) - 9 flutes with hob in each. HEAVY HOBNAIL Vases: Disclosure of the necessary elements which separate this design from the more familiar one we know as RUSTIC, are quite evident in this photo. For further information surrounding the two patterns, written by Frank M. Fenton himself, please click into our segment called Heavy Hobnail Vt. listed on our homepage. This photo clearly displays the requirements for the applied name! Orange Tree Orchard pitcher - Marigold. 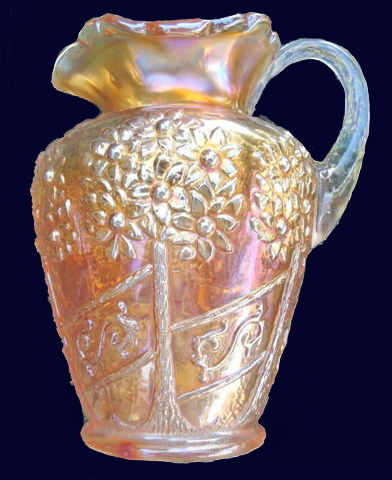 ORANGE TREE ORCHARD Pitcher: The Orange Tree pattern was marketed in 1911. This Orange Tree Orchard design dates from the 1912 period. While Orange Tree is found in table set, water set, punch set, breakfast set, berry set, hatpin holder, puff box, footed fruit bowl, mugs, loving cup and plate, the “Orchard” design is found only in a water set. Blue, marigold and white examples are known. BUTTERFLY & BERRY pattern, Mid-Spring 1911 Butler Bros. Catalog. BUTTERFLY & BERRY 4 inch Sauce - Red - Seeck Auctions. Marigold 5.75 in. diam. BUTTERFLY & BERRY - PANTHER interior. 10 inch White BUTTERFLY & BERRY Master Bowl. Sold for -$1250. Nov. 2012 - Seeck Auction. BUTTERFLY & BERRY: An early and very acceptable design which extended into the pastel era. 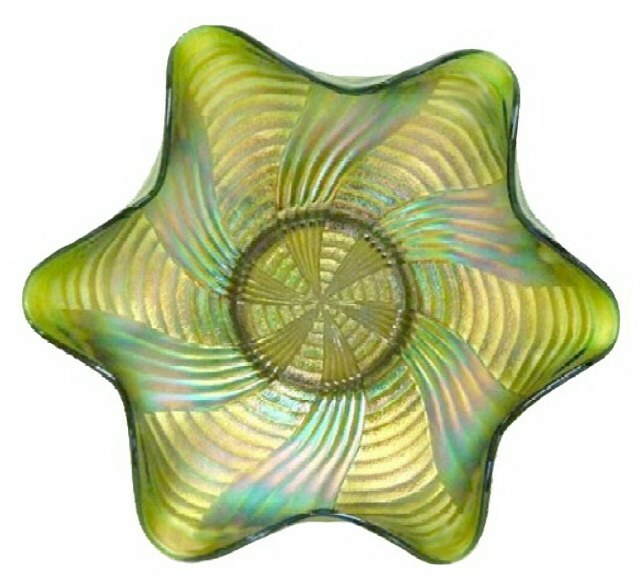 Fenton’s #1124 pattern was primarily produced in Blue and Marigold. 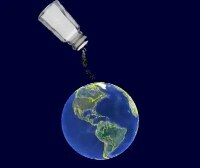 Green and amethyst are more difficult to locate. 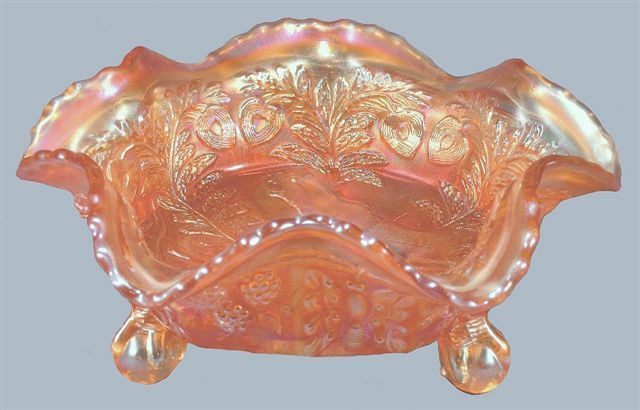 In addition to a water set, hatpin holder, swung vases and a table set, the berry set featured four different interior patterns: the standard wreath of grapes, the Panther, the Hearts & Trees, and the Fantail. Emphasizing the long term acceptability of the pattern, a few red examples and an occasional white master berry bowl having the wreath of grapes interior can be found.